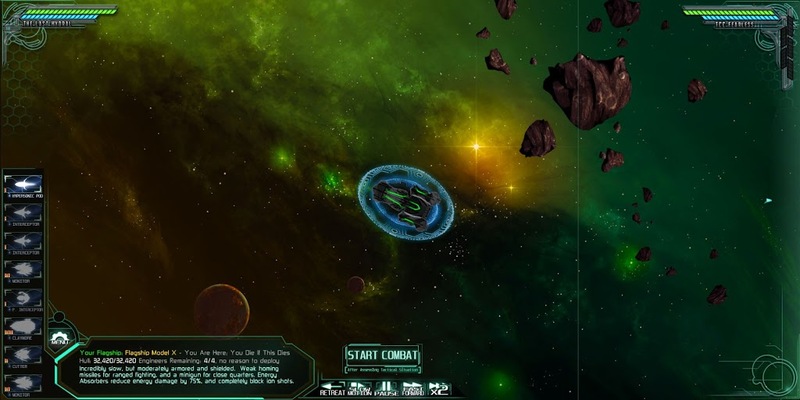 The Last Federation is a really unique game in that it is a strategy/tactics game set inside a simulation game. Check out our preview discussing simulations in the game, the description of your role as an independent agent in the solar system, details on the alien races, information about the “butterfly effect” in the game, and the final scene art for all the alien races, some of the planetary art, and screenshots of the solar map. Oh, and the forums for the game are filled with lots of other detailed tidbits, too. This is Arcen’s largest title ever, and we’re really excited to share it with folks. Alpha Information! Private alpha testing with players is currently in progress, and we will be adding more players throughout the coming weeks leading up to release. If you’re interested in signing up, please see this forum post. Right now we do have open spots still, but we may wind up needing to close signup past a certain point, because we definitely have a pretty huge list of people at this point (and there’s only so much feedback we can process at any given time). For a variety of reasons, some of them relating to the game itself, and some of them relating to other titles that we don’t want to get stomped by in the marketplace (cough Titanfall cough Diablo 3), we’ve decided to push back the release date of this game into April. It may be as early as April 2, or a bit later on in. It’s been a month since we’ve added any alpha testers to the testing pool, and it’s also been a month since we gave our existing testers anything new to do. We’ve been working away behind the scenes all this time, which is a first for us — going a month in the middle of a testing cycle without releasing anything new to test. Now we expect to be back to our usual rapid-cycling schedule. I have not sent out the PMs yet, but if you have signed up to be an alpha tester, I will post the list of the people being added in this round on the forums here in a bit. Note for testers: for the updated list of what still needs obvious tidying, please see this document. It’s not really all-inclusive of what we still have planned for the game prior to 1.0, but it hits the notes about things that we think are impeding the new-player experience in particular. As you will see below, the existing combat video could not be less representative of the game at this point. The combat isn’t really even the same genre anymore. We showed you RTS-style tactical combat before, and now the combat is still tactical but is entirely different. I also will be getting you some video of the solar map stuff in action, although I did post a few screenshots of the solar map a month ago. What’s This About New Combat? Basically it was always you against some other single ship — an enemy flagship or an enemy outpost or whatever. Your health and shields on the left, theirs on the right. You both had squadrons of ships inside your flagships, and they would auto-deploy at various speeds. You then control it like an RTS, mainly. Whoever kills the other enemy ship first, wins. There were a variety of things that made it more complicated from time to time, but overall that was kind of it. The biggest complexity was in the solar map, and that’s where the real “meat” of the game was. Unfortunately, the combat just really wasn’t something that was holding up its own weight in this sort of model — it just lagged behind the rest of the game in the fun-factor, and so that was something we sought to address in a number of ways. For one thing, the above interface is a lot more attractive, and it was also more functional in a lot of ways. Not shown in this particular screenshot is the “special abilities,” of which you could have up to three. These were special flagship-based abilities that you could trigger to do something like cloak your fleet, or loose anti-swarm lasers, or whatever. That added an interesting element to the game, and it was something our testers played with some, but it frankly just wasn’t enough. What I’m about to say is why we don’t use Kickstarter if we can at all help it. One of the reasons, anyhow. I get asked about this all the time, so here’s a great example of why: we decided to radically alter the way that combat works, based partly on the feedback we were getting from testers, and then based on our own testing, too. There are now quite a few more enemy flagships than just one (or even 5, as there were in one version of the game). There are also a lot of allied flagships, potentially, too. So you still see your own shields and health in the upper left, but that’s it. 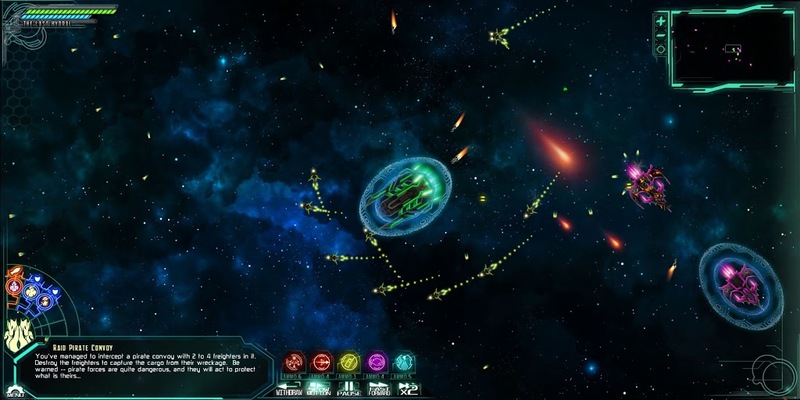 Other large ships and structures show increasing amounts of damage on their hull (you can see that on the Pirate Raven in the middle-right of the screen), and show their shields dimmer (and then gone) as a quick visualization of their status. You can also hover over them to see what is going on if you like. It is possible for you to get other ships that are “yours” at times, but you still can’t control them. They run on predetermined AI depending on the type of ship they are. BUT! Usually they also have guns that are triggered when you trigger your main gun, which is really cool. 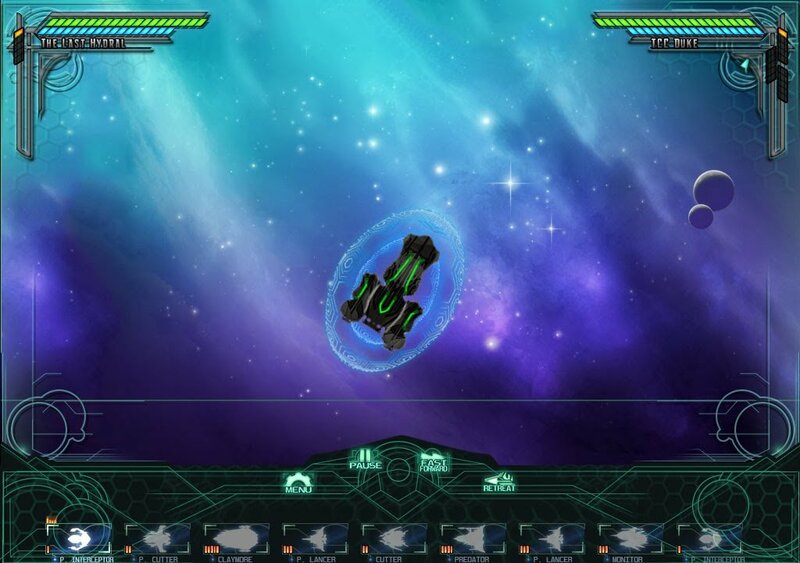 So you can cause them to aim at your mouse cursor just like your flagship does, and fire when you fire. It is now possible to have up to 5 “sides” involved in a battle, not including you. So 6 in all, if you include yourself. Each of these sides have either an allied, neutral, or enemy stance towards one another, and towards you. You, in turn, either can have a guns-free or hold-fire stance toward each side. All of your relationships to the other sides in the battle are shown on the lower left of the screen. In this particular example, you can see that I am enemies with the Thoraxians, and by default I am guns-free against them. It’s rare that you’d want to hold fire against someone who wants to kill you, but you can. You can also see that I am allied with the Acutians and the Andors in this particular battle. They and I are cooperating to attack a very dangerous pirate convoy, as it turns out. Whatever our relationships in the larger game are, we’ve come together for this one battle, anyway. Previously, the viewport and zoom worked basically like AI War or Bionic Dues. You could pan around at will, zoom incredibly far out, etc. The ability to pan is now completely gone, and your ability to zoom is a lot more limited — you can still zoom out, but not very far. Basically this is somewhat simulating your “line of sight,” but mainly it facilitates you actually being able to aim your direct guns. There are a lot of reasons this works better in the new combat model, but it just feeling more natural and fun is a big part of it. Not being omniscient on the battlefield is well-known as a fun thing (hence the fog of war in many RTS games), and being focused on your immediate surroundings helps to make the experience more immersive in my opinion. Not that I’m saying I would change AI War or Bionic Dues, or that that zooming/panning model is wrong for them. It’s perfect in those contexts, to me at least. But this game is now a lot more divorced from them, and so for this particular context this new view style makes a lot more sense. Replacing the ability to pan and to far-zoom, and that old (hard to see) “enemy offscreen in that direction” indicator, is a nifty new minimap that you can toggle between three different sizes. This minimap is pretty omniscient, but all it shows you is three types of blip: “something important,” flagship, and squadron. So you can find stuff around you, but you don’t have details of exactly what each blip is beyond its category. This turns out to be a really happy medium between being completely blind in a fog of war (not fun in a large space) and being omniscient (in this context, also less fun in my opinion). Secondary weapons are either things that you trigger with a quick keypress or mouse-click and which do AOE damage around you or home onto a specific enemy or whatever, or they are things that “arm” an additional weapon that gets added to your left mouse button (so that you fire both your normal primary weapon and the newly-armed secondary weapon at the same time). Your primary weapon has infinite ammo, but your secondary ones (and abilities in general) do not. The default speed of combat is now about half as fast as what was shown in the last video. It’s something that people went “wow that seems way too fast” as the main complaint there. You can easily slow it down even more if you prefer, to whatever floats your boat (or speed it up, even). You can do that when you start a new game, during battle, whenever. Also during battle, you can temporarily slow it down 4x by tapping the Slow-Mo hotkey or on-screen button. If you’re worried about the ability to aim at ships in a crunch, this is one way to get around that. Fast-Forward has also been joined by Super-Fast-Forward, which is something I use a lot when I want to zip across a gap of space. Since these are more dangerous than slow-mo, these you have to hold down the button to make them go faster, rather than tapping them to toggle. Sometimes there just isn’t anything that I need to make decision on for a moment, and there’s no sense in me just sitting there waiting out the clock. Being able to quickly adjust the flow of time really helps to make the pacing feel super smooth at all times, because the pacing is exactly whatever I want it to be. “Retreat” can be such an ugly word. It implies failure. In the new combat model, however, it is entirely likely that you may enter a battle ostensibly with one set of goals, but really you actually have some other secret goals that you have set for yourself. You then set about doing whatever it was you wanted to do, and then you withdraw. In that case do you “fail” the main action that you were hired to do? Heck yes. Do you care? Not a bit, because your acceptance of the main action was just a ruse in the first place. Other times you’ll be withdrawing because you simply are outgunned, and it really is a retreat to save your hide. It’s important to know when to do this. And still other times, withdrawing successfully is simply the last step in successfully resolving a battle. Your goal frequently has nothing to do with “just go in and murder everyone.” Instead the enemy forces are an obstacle to your going in and destroying or capturing special enemy ships, or whatever else your target is. The enemy forces are understandably pissed after you do this, so the last step is managing to actually withdraw successfully without getting killed. This is a really key thing. Previously, the combat was a bit too mini-game-ish for my taste. That’s how it was originally conceived, but that bothered me increasingly much. The fact that we had an auto-resolve option in the game was kind of a testament to the fact that combat was basically just a skill check. All in all, the solar map previously had this cool feeling of you being the small guy in a much larger living ecosystem of aliens, but at the same time you being able to affect things from the shadows in a very powerful way. Combat did not have that feeling. Now it does. I tend to really think of the new combat as being “Batman in space,” in a lot of ways, heh. As mentioned before, your guns don’t have ammo, but your 5 special abilities all do. Previously, you had to visit any planet or outpost to get the ammo replenished. That meant that conservation of the ammo between multi-stage battles was important. In the end that didn’t add much, so now you just get all your ammo back after each fight. Health previously worked the same way, in terms of you getting that whenever you visited any planet or outpost. But THAT tended to cheapen health, and reduce the tension in ways that I didn’t like. The goal with that auto-restoration was to make it so that you didn’t have a fiddly case of having to go and heal constantly at some specific location, and wade through menus to do so. 2. You successfully complete any friendly military action for any race, and they’ll heal you for free in gratitude. This makes it so that health is a bit more scarce in some circumstances, but not in others. It’s a pretty interesting dynamic, and I find that it makes things pleasantly tense in fun ways. We’re continuing to test and refine, of course. There are also some straggler features and content, most of it relating to the new combat model, that we want to get in there. There’s also some visual stuff that we haven’t had time to polish to our liking, and the sound effects are yet to be added (although probably 80% of the music is in place now). This sounds great! Is the music again done by Pablo Vega? There’s a new vocal track featuring Hunter Vega in a duet with another woman, too — really killer stuff. This time for the ending credits rather than the opening menu, though. Awesome. Very much looking forward for this game, I assume you guys will deliver as always. If you want to sign up through the forums, there is still time! We just added in another 12 folks yesterday, and we’ll continue doing so gradually over the next month.